Eavesdrop> Bilbao of the Midwest? 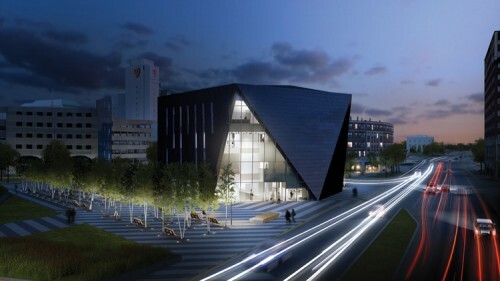 - Archpaper.com Eavesdrop> Bilbao of the Midwest? If you read this column, you know Eaves loves a party. You also know we self-deprecatingly speak of mediocre Midwestern cities (we’re from Louisville). Even with summer winding down, there’s no need to stick out that lower lip. A slew of—well, ok, three–high profile openings will tickle even the slightest art and architecture enthusiast as Cleveland, East Lansing, and Cincinnati compete for the title of Bilbao of the Midwest. First up, the Museum of Contemporary Art Cleveland, designed by Farshid Moussavi Architecture, opens on October 6. Will the Mistake-on-the-Lake become the Rust Belt Riviera? On MOCA’s heels comes the Eli and Edythe Broad Museum on November 9. OK, we don’t know anything about East Lansing other than a school’s there, but—hey!—now they have a Zaha Hadid. And finally, Cincinnati, home to America’s first Hadid, will welcome 21c Museum Hotel by Deborah Berke & Partners. Their website says it will open late 2012. Which project will be an urban game-changer? We could be swayed by opening night invites, but right now my money’s on Cincy.